I still remember sitting in stunned silence on Memorial Day, 2011. DC Comics was set to reboot their entire universe, not only relaunching each series at #1, but in effect restarting the universe from scratch. To me, DC Comics’ heart and soul was their history, it was their "legacy heroes", it was their bloated and unwieldy continuity. To imagine a DC Comics without its "baggage" was (unintentionally) intimidating. The Flashpoint-to-New-52 corridor was successful in drawing new eyes to DC properties (in the short term, admittedly). There was also a vocal contingent that was in opposition to the endeavor from the get-go. A common response to the complaints that I observed from time to time online was "Imagine if the Internet was around during Crisis on Infinite Earths..."
Well, it kind of was... in the form of Usenet and Bulletin Board Services (BBS). Usenet is credited as the first Internet peer-to-peer technology, where files can be shared and digital conversations can take place. Among the items discussed on these relatively primitive forums was comic books. 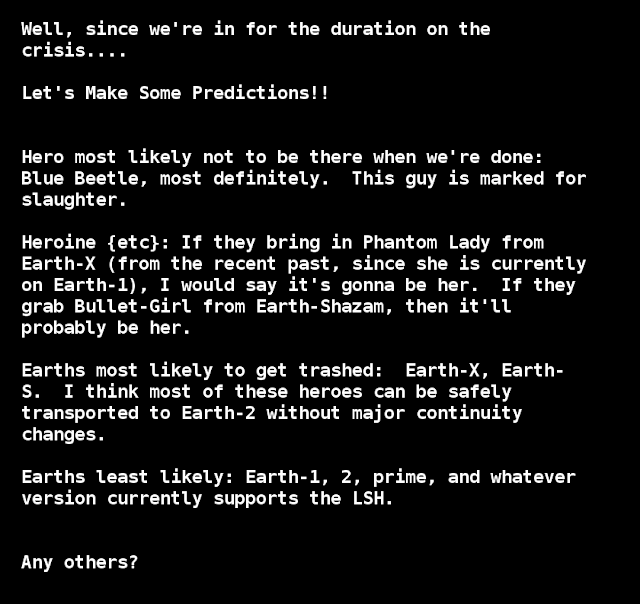 Using various web-crawling avenues, I have been able to "track down" some Usenet/BBS comic book chatter dating as far back as 1983. This afforded me something of a front-row seat to observe the initial first-hand reactions to such events as Alan Moore’s take on Swamp Thing, A Death in the Family, Watchmen, The Dark Knight Returns and the subject of today’s (and likely the first several) piece, Crisis on Infinite Earths. This piece seeks to be part time capsule, part commentary and I hope it proves to be entertaining and insightful. When "F" sent this missive Crisis on Infinite Earths had not even shipped its first issue (Mike’s Amazing World of Comics lists January 3, 1985 as CotE #1’s release date), so this is as untainted a prediction/guesstimate as we’re likely to come across. Let’s begin with the first prediction. The "slaughter" of the Blue Beetle. This one is interesting. Charlton Comics (Blue Beetle's original publisher) had suspended publication in 1984 (with a brief attempt at revival in 1985), and many of their superhero properties were acquired by DC Comics in 1983. 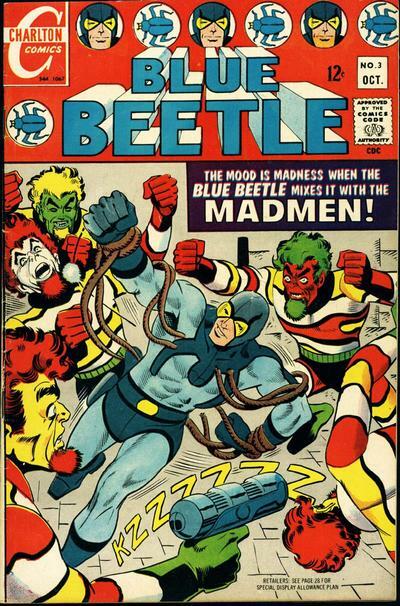 Prior to the DC acquisition, The Blue Beetle’s last self-titled outing was in late 1968 (Blue Beetle vol.2 #5). 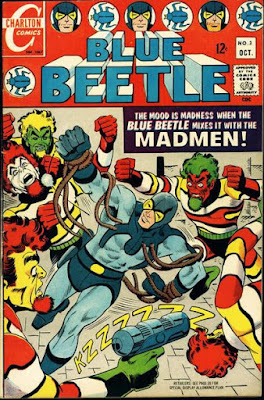 If we are to consider that the Charlton heroes that would be folded into the DC Universe along with Blue Beetle included Captain Atom, Nightshade, and the Question, I suppose if we had to "slaughter" one, Blue Beetle may be the most likely bet. His character being that of a wealthy inventor may also prove his existence in a unified DC Universe as somewhat redundant to Batman. Lucky for Beetle, the Crisis did not require a Charlton-flavored sacrifice. Phantom Lady was a DC acquisition from Quality Comics. As "F" stated, Phantom Lady inhabited Earth-X, fighting alongside Uncle Sam and the Freedom Fighters in a world where Nazi Germany won World War II. DC Comics acquired the rights to the Quality Comics characters all the way back in 1956. In the years leading up to the Crisis on Infinite Earths, the Phantom Lady was a citizen of Earth-2 and featured as a side-character in the All-Star Squadron (a title and team which had an indefinite future itself). Phantom Lady was a decent bet for not making it out the other end of the Crisis… however, she too would survive… albeit not unchanged. Newly retconned as a member of the Knight (Starman) family, the Post-Crisis Phantom Lady first decided to don a costume in tribute to her cousin Ted "Starman" Knight. She would marry Superman Analogue Iron Munro and give birth to a child. In the years that followed the Crisis, a second Phantom Lady (Dee Tyler) was created, appearing as part of the Action Comics Weekly anthology run. She would make several appearances before meeting her unfortunate end during Infinite Crisis (2005/2006). 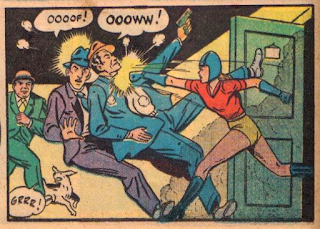 Bulletgirl from Earth-S(hazam) was a Fawcett character with origins in the Golden Age of comics. DC acquired the Fawcett character rights in 1972, and Bulletgirl along with the rest of the Fawcett heroes were set on Earth-S, where they formed Shazam’s Squadron of Justice. 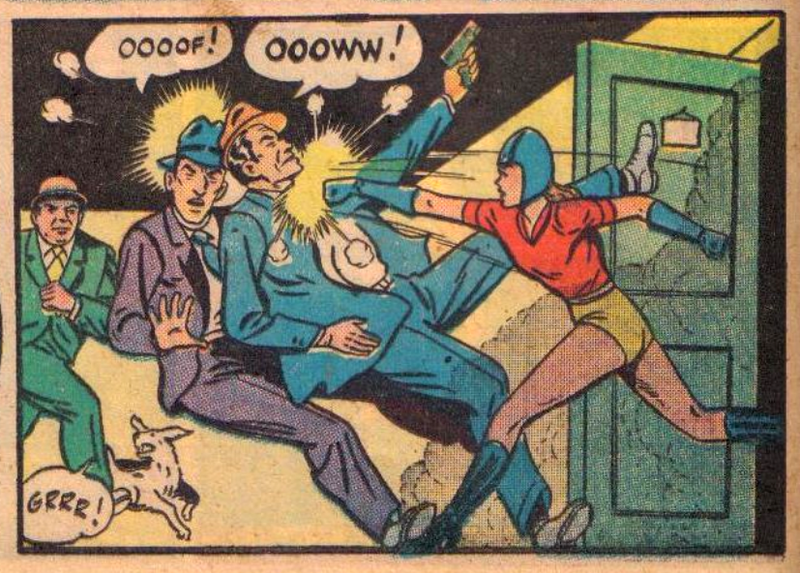 Leading up to the Crisis, Bulletgirl (along with Bulletman) was retconned into having been members of the All-Star Squadron. She ultimately survived the Crisis as well. Earths most likely to get trashed... Now there’s a loaded concept. "F" believes that Earth’s X and S will not survive the Crisis… and, she's right. She continues that many of the heroes on said Earths could easily be moved to Earth-2. Of the characters discussed today, two of them were, for all intents and purposes moved to Earth-2 even before the Crisis. 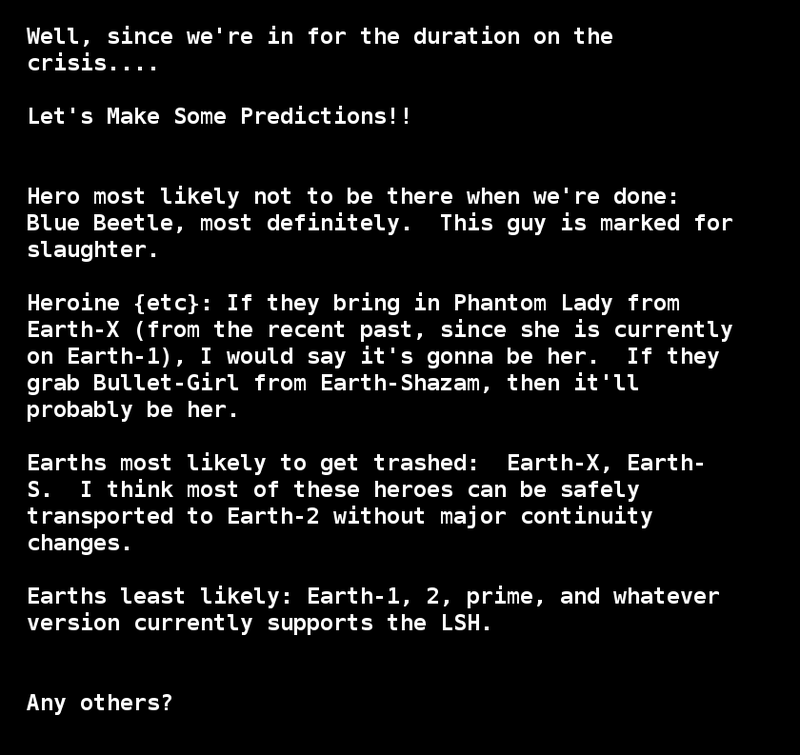 Earths least likely to get trashed... Earths 1, 2, Prime, and the one the Legion inhabited. Well, "F" is part right in this prediction. Earth-1 did in fact survive… Earths 2 and Prime did not. Two decades later, Infinite Crisis will show us that certain members of those Earths survived the Crisis… however, their Earths did not. As for the Legion... I am not sure which Earth the Pre-Crisis team inhabited. I do know that the Legion’s history was greatly affected by the fallout of the Crisis, as it was established that their inspiration for becoming heroes (Superboy) never existed. I often get mixed up when discussing Post-Crisis Legion… suffice it to say, the Superboy that inspired them was from a pocket universe devised by the Time Trapper. That’s all from "F", we will continue our exploration of Crisis-level predictions and reactions next time. If you have any corrections or additions to the above, please feel free to contact me in care of this website. PLEASE NOTE: All words written on this page that aren't italicized were written by Chris Sheehan. If you want to attribute any of this work, please credit Chris Sheehan.